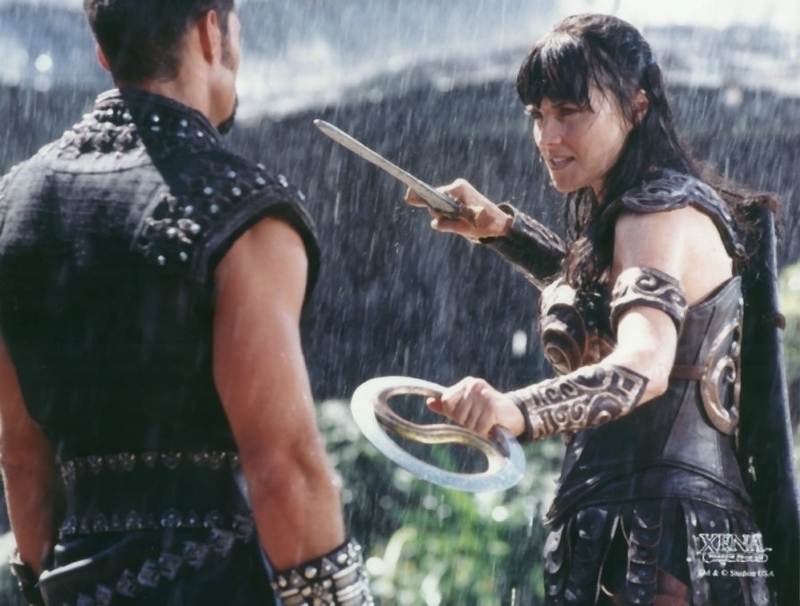 The Sixty Best Episodes of XENA: WARRIOR PRINCESS (31-35) | THAT'S ENTERTAINMENT! With all that said, let us resume with episodes 31-35 on the list. Yes, this is the Season Three finale — one of Xena’s most infamous episodes — and features the series’ most suspenseful cliffhanger. More tense and fast-paced than Part One, this is an exceptionally strong two-parter that, despite it’s FLASH, has real meat. Continuing where the first part left off, Hope is reborn in the spitting image of Gabrielle. When Callisto learns that Hope has teamed up with Ares, she decides to join and fight with Xena. STOP READING THIS DESCRIPTION NOW IF YOU DO NOT WISH TO BE SPOILED. Gabrielle, to protect Xena from the Fates’ decree, tackles Hope and they both go tumbling into a lava pit to their presumed deaths. And Xena kills Callisto in perhaps the most chilling moment of the episode. I’ve loved Xena for so long that I can’t recall when I first saw Gabrielle’s sacrifice. I’d imagine it would be a shock if you didn’t know it was coming. This episode crams a lot of story in, so it will be generally more exciting to casual viewers. Lots of great moments here, especially between Xena and Callisto — making this an important and incredibly entertaining episode. It’s funny to be discussing Part One after Part Two, but Part Two is slightly better than Part One. A lot of set-up occurs in this episode. Xena and Gabrielle recuse Seraphin from being sacrificed, only to learn that the girl WANTS to be killed in the name of a god. They also learn that Callisto has escaped from the vortex (where she was trapped in a Hercules episode) and been freed by Hope, who happens to be the goddess for whom Seraphin is being sacrificed. There is some really dramatically satisfying stuff between Xena and Gabrielle when they have to essentially confront Hope for the first time since she killed Xena’s son. Also, Ares’s deal with the Fates adds extra conflict, and despite some difficulty swallowing the whole arrangement, it’s nice to see that the debt Gabrielle owes him is called back into question. This episode builds to Hope’s rebirth, so Part One, despite having MANY great moments, is not quite as exciting as the second. I think this part is better written than Part Two, but the story is not as strong here. Obviously, if you’re going to watch Part Two, you should watch Part One first. 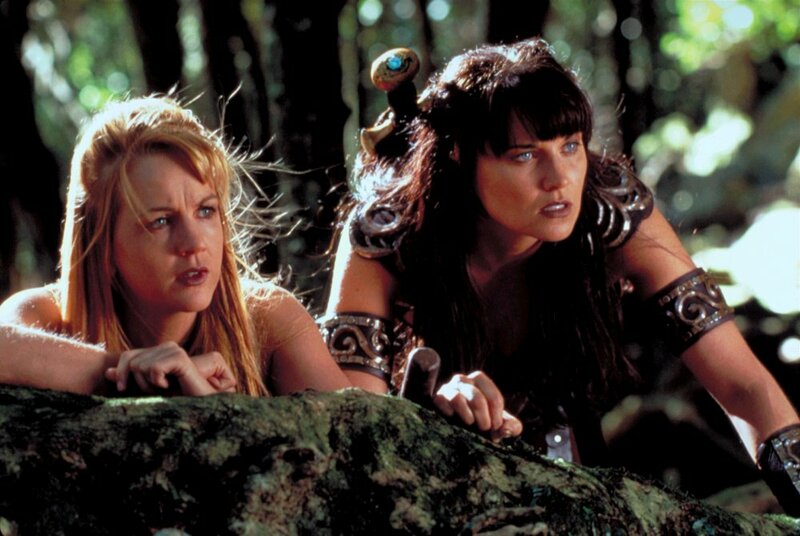 Heeding her vision, Xena travels to Gabrielle’s home town, where she’s reunited with her presumed-dead friend. Or is she? This is one of those episodes that I loved, then hated, then loved, and then hated. Now I love it and I’ve decided to stick with loving it. The major quibble that I, and most fans, had about this episode is that it does a poor job of explaining how Gabrielle and Hope got out of the lava pit. So poor, in fact, that the episode before the Series Finale (6×20: “Soul Possession”) had to explain what happened. (That episode had so many plot holes itself that I can’t even address it here.) But contrary to the explanation given in 6×20, close examination finds that the answer actually IS in “A Family Affair”… if you choose to believe it. When Hope is masquerading as Gabrielle, Xena asks how she (as Gabrielle) escaped from the pit. Hope (as Gabrielle) says that she fell into a crevasse and tunneled out. Later when the real Gabrielle confronts Hope and questions her about Hope’s survival, Hope says that Dahak saved her. So though Gabrielle herself never physically explains what happened to her, Hope (as Gabrielle) does. And that’s good enough for me. That issue aside, the Destroyer, Hope’s son, is a FABULOUS villain — one that we really care about. His death scene is more tragic than scary. Again, lots of great moments. Joxer is particularly solid in this episode. This is a strong episode if you can accept the fact that the lava pit explanation isn’t as concrete as it should be. This is another splashy season finale and I’ve admittedly flip-flopped my opinion about this episode as well. Putting an end to the Twilight of the Gods story arc that lasted for over 60% of the season, this is such an important one… filled with twists, turns, and ACTION. Eve has realized the error of her ways and is baptized in the name of Eli. Eli (as a beam of light from Heaven) then grants Xena the power to kill gods. Good thing too, because they’re all after her now. Xena kills a bunch of them, but the Furies have infiltrated Gabrielle’s mind. Gabrielle stabs Eve, and Xena, in a gut reaction, slices Gabrielle’s head open with her chakram. With both Eve and Gabby near death, Aphrodite agrees to take them to Olympus to fight Athena. I’ll give no more spoilers after that except to say that there’s nice resolution given to Xena and Ares’s Season Five arc. But the thing I like best about this episode is the action. The dramatic moments are fine, but everything is, again, HIGH DRAMA. It’s important to understand that going in. This is a really big episode… one you’ll need to watch more than once. After you’ve finished the first 21 episodes of the season, that is. I covered Part Two last week, where I mentioned that Part One is the stronger of the two. Part Two, while featuring great fights and intriguing flashbacks, is never as interesting as Part One — which sets up its status as a cool episode from the moment it begins with great cinematography and a really interesting concept. Xena goes searching for Gabrielle in the Amazon Land of the Dead. Once she gets there, she learns that a bunch of Amazons can’t cross over because an evil shamaness is stealing their souls: Alti. 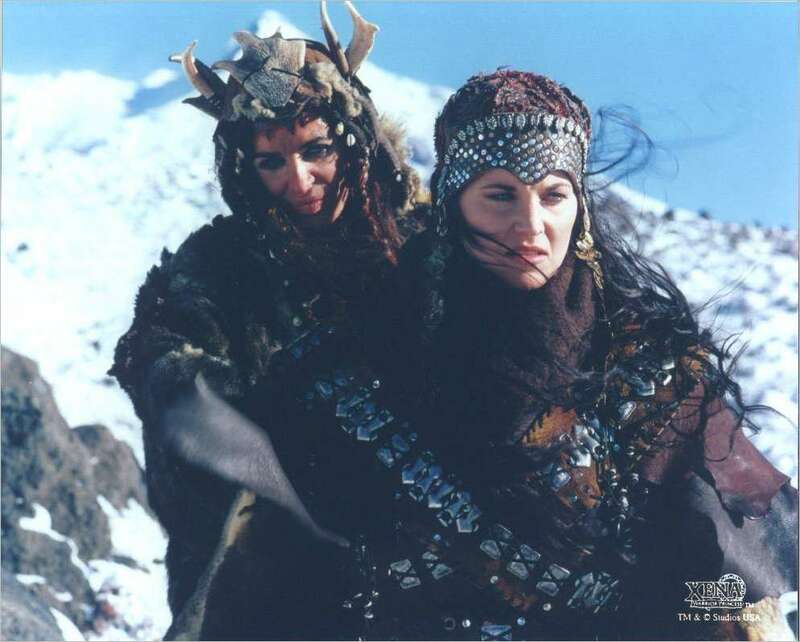 Evil Xena once allied herself with Alti, as we see in flashbacks. Now Xena must fight her. The best part of this episode is the final fight where Xena and the Amazons go against Alti’s righthand man, the Berserker, and we learn one of Alti’s powers is making her enemy experience pain from both their pasts and futures. Alti’s such an interesting villain that is often maligned by being compared to Callisto. People, Callisto and Alti are not alike! Callisto is a RESULT of Xena’s past. Alti was a FACTOR in it. And though Alti’s later episodes are never as good as this first one, here she definitely hits the right notes — as does this bizarre, but beguiling episode that is slightly more entertaining than it’s second part. As with all two-parters, I recommend you watch both! Come back next Thursday for numbers 26-30! And check back tomorrow for another Film Friday post! Pingback: The Eight Worst Episodes of XENA: WARRIOR PRINCESS (Post 2 of 2) | THAT'S ENTERTAINMENT!